The Sakya Academy monastic school in Dehradun was founded by Khöndung Gyana Vajra Rinpoche, under the guidance of His Holiness the Sakya Trizin. It embodies its founder’s vision of bringing young Sakyapa monastics into the 21st century while immersing them in the Buddhist tradition that is the mainstay of their monastic training. 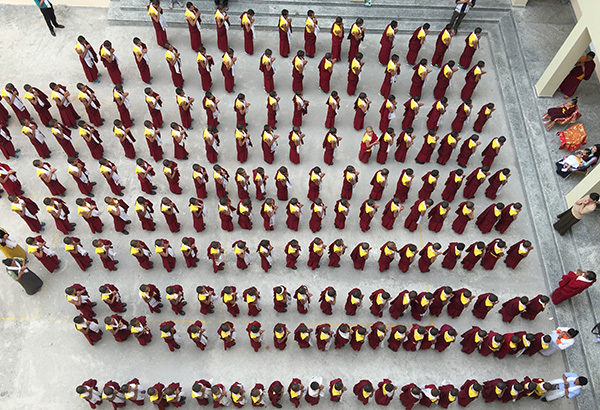 The school now harbours some 200 monk students, with a view to eventually accommodate 250 monks and 250 nuns. The Academy’s curriculum consists of daily periods of Buddhist Scripture studies and prayer recitation alongside classes in all subjects as taught in normal secular schools. A great deal of emphasis is placed on extracurricular activities, which include daily organised games, workshops in art, music and dance, yoga, environmental activities and discussion groups. Special attention is paid to the development of the school as an environmentally aware entity, where every effort is made to apply Buddhist principles to the preservation of its habitat. With this, Rinpoche is intent on forming well-rounded human beings who can be efficient vehicles for the preservation and dissemination of the invaluable teachings of the Lord Buddha both within the monastic fold and among the community at large, who can teach themselves and others to integrate the Buddha’s wisdom into all activities, both religious and secular.